Sonoff TH 10/16 is a Sonoff version smart switch that can monitor and set temperature and humidity through the APP eWeLink. Just as the name indicated, the new version Sonoff TH device supports two power supply specifications: 10A or 16A. Sonoff TH 10/16 is a Sonoff version smart switch that can monitor and set temperature and humidity through the APP eWeLink. Just as the name indicated, the new version Sonoff TH device supports two power supply specifications: 10A or 16A. It supports preset a temperature and humidity range, when the temperature and humidity of the environment has reached the range, it will automatically turn on or turn off connected devices. The device supports connecting to three kinds of temperature and humidity sensors (AM2301, DS18B20, DHT11). Actually, Sonoff TH 10/16 can work as a Sonoff when without connecting to sensors. 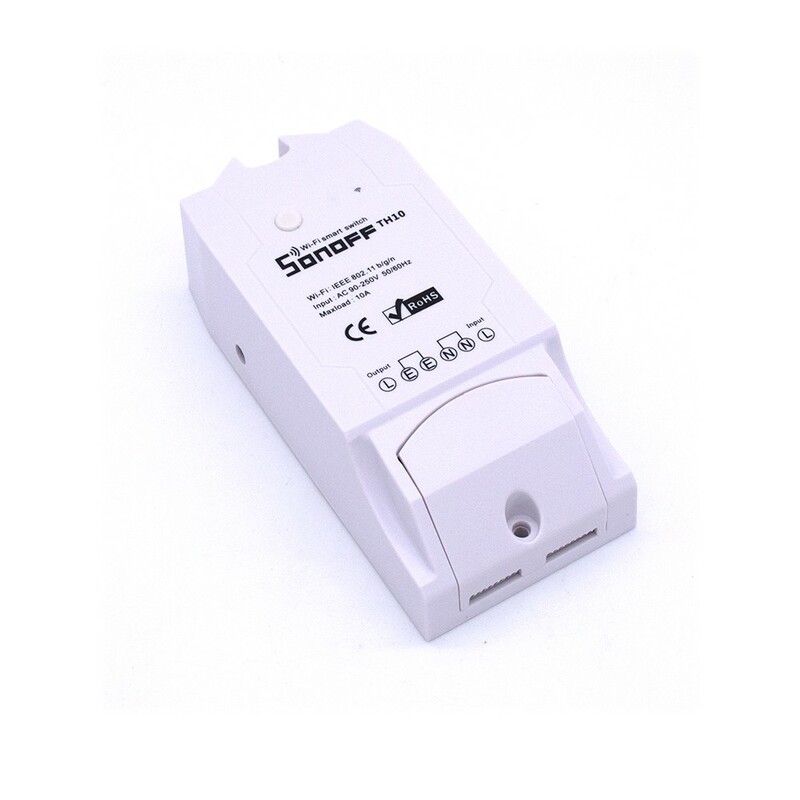 But compared to Sonoff, Sonoff 10/16 is more safer, less radiation and in bigger size, easy operation. Most importantly, with the support of latest ewelink app, you can create chains of simple conditional statements. This means you can use the them with temperature and humidity sensors (AM2301, DS18B20, DHT11) to collect data, while these data can be shared to other ITEAD smart home devices(Sonoff, Sonoff RF, Sonoff SV, Slampher, smart socket, etc.) under your account, thus other devices can use the data to control connected appliances. This device is perfect to work with electric fan, air conditioner, humidifier. Please note that this version does not have 433 RF function. Started form Aug.31st 15:00, all Sonoff TH10 and Sonoff TH16 we deliver will have enclosure. Price stays the same. Please note! Operating temperature range: -40 ? - 125 ?